When is it Okay to Give a Facial Flex? When is it okay to give a Facial Flex? This is not as tricky as it sounds. Be honest. Be specific. Try this: You are going to love what I got you. I got you a Facial Flex because I love mine. I could have gotten you a Tickle me Elmo, or one of the new ice cube trays that makes round ice cubes, or Star Wars socks, but I decided that I would get you something that would make you feel great beyond the Holidays. I hope you love this face muscle workout device. The skin on our face begins to loosen in our 30’s. However, exercising with Facial-Flex® from age 20, will help protect one’s skin from aging throughout adulthood. 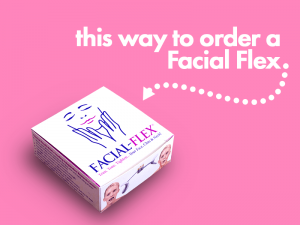 Facial-Flex® has been clinically proven to be effective in significantly increasing facial muscle strength, uplifting, contouring and firming the face in individuals exhibiting the effects of facial aging due to weakened facial muscles. Tell them for an extra 4 minutes a day, 2 minutes of exercise in the morning and 2 minutes of exercise at night and one will trim, tone and tighten one’s face, chin and neck in a matter of weeks. One works out to stay healthy, strong and youthful, and Facial-Flex® applies that same logic to the 30+ muscle groups that support one’s face, chin and neck. Carrying extra weight (especially around one’s neck and under chin area) are known contributors in some cases of snoring. If this is the case, using this face muscle workout device is one way to find out. If one is solving this by performing facial exercises twice a day, why not do them with resistance and why not use the Facial-Flex®. There are different strength bands for different resistance with our face muscle workout device. Facial-Flex® is a FDA Registered Class 1 Medical Device that exercises over 30 muscles of the face, chin, and neck. It is the first, and only, progressive resistance exercise device clinically proven to tone facial muscles, reduce wrinkles, and provide facial rejuvenation. Using the device for just two minutes twice a day, will result in a more youthful appearance. Clinical Studies are available to further back up our claims. Facial-Flex® was originally developed for rehabilitation of patients with facial burns. The device can be used to rehabilitate patients with Parkinson, Cerebrovascular damage and others. It has also been used to help patients with speech and language issues, facial nerve disorders, strokes, TMJ, and more. Why not introduce them to Facial Yoga (or Facial Flex)? Facial yoga is rapidly becoming the anti-aging treatment of choice for many; it has the same benefits as yoga, but it targets face muscles by relaxing and toning them. The Facial Flex face muscle workout device be used to perform shaping and contouring exercises. Don’t worry too much about being misunderstood. Sharing this facial muscle workout device you’ve found that is making you happy with a friend seems like a very nice thing to do. Who knows. Maybe someone is putting a Facial Flex on their list for you. You never know. So if your pals fall within the categories of #menolikeymyneck, #flexzone, #stopsnoring, #skeptic, #fighter and #yogi, consider Facial Flex. It is a great gift for all! Do you have any feedback TMJ being triggered by using the facial flex? Susan, we actually have feedback saying the opposite! The Facial-Flex device has been used for TMJ rehabilitation in the past and there have been clinical studies which support that using the device could have a positive improvement. You can find the summaries here: https://facialflex.com/proven-results/clinical-studies/ Every case is different, though, so please review these with your doctor if you have any concerns.